With the transition of late spring to early fall comes some of the best days of the year for our furry family members. Long leisurely days spent by a lake or walking down a cool trail make fill many of hours. We as pet parents take many precautions to protect the safety of our pets during these times. We protect them from known evils, but it is the unseen and the unknown that poses the greatest threat. The grass awn is a small, unassuming bit of fauna. It is produced as the seedling of various types of grasses. Many would not expect plant material such as this to be a problem for their lovable pups. These small foxtails pose a huge problem to dogs, leading to serious and even life-threatening conditions. 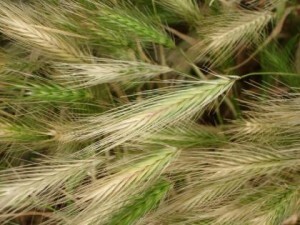 Tall grasses such as wild barley produce conical, brush like seeds. These seeds are composed of barbed awns, and these awns are what pose the risk. The offending grasses grow in fields, along hiking trails and even in backyards. They can be found throughout the United States, but are most common along the west coast. When are they a problem? When these grasses begin to flower, their brush-like seeds are soft and unthreatening. As the weather warms and they begin to dry out, the now brittle awns break off and are picked up by our pets. From late spring to early fall is when foxtails pose the greatest threat. How do they pose a threat? Foxtails pierce the skin and migrate, leaving tissue damage and infection in their wake. It is the shape of the awn that provides it with this destructive potential. Each awn has a sharp point, with bristles that fan out from there. Were you to brush this foxtail with your finger, you would feel that it is quite smooth moving with the bristles. However, the spikes resist motion in the opposite direction. This same thing happens in the body. The awn is picked up in the fur, is eaten or even picked up by sniffing. The pointed end and barbed bristles allows the awn to shift through the hair until it reaches and penetrates the skin. From that point, through muscle contraction, the awn can migrate through tissue. It can only move forward-making them especially difficult to remove. The foxtail brings with it a legion of bacteria, causing infection along this migrating tract. This can lead to serious problems, and can be life-threatening depending on the tissue involved. The most common locations to see foxtails are between the toes, as well as in the nose, eyes, ears and armpits. They can also migrate into the lungs or abdomen. Which dogs are typically affected? Dogs with longer hair are most commonly affected, although any dog can develop a problem. The long hair is better at trapping the awn than short hair, giving opportunity for further migration. What are the typical signs seen? This is dependent on where the awn has entered and migrated. Generally, swelling, pain and discharge at the site of entry are the most common signs. The dog may be limping if the foxtail entered at the foot, or sneezing and nasal discharge if it is moving through the nose. Signs become even more serious if the awn migrates through the chest or abdominal cavities. What can be done to help affected dogs? Veterinary care should be sought immediately. Treatment depends on the part of the body affected. Broadly speaking, the foxtail needs to be removed, the wound cared for and the associated infection treated. The complexity of this task changes with the path of foxtail migration. How can you protect your pet? Despite taking precautions to avoid foxtails, there is no guarantee that your dog will not be exposed to this wily fauna. Knowing where they are found, what they look like and what signs may indicate exposure are important tools in protecting your pet as you enjoy the outdoors. Dr. Mikala Brown is a Surgical Intern at Aspen Meadow Veterinary Specialists. AMVS is a 24-hour veterinary facility providing specialty internal medicine, orthopedic surgery, oncology, emergency, critical care, and pain management. They are located in Longmont at 104 S. Main St. For more information, go to www.AspenMeadowVet.com. Site contents copyright © 2019 Recorder Online	except as noted. All rights reserved. | 90 queries in 2.428 seconds.